Ce drame de guerre conventionnel glorifie à outrance l'interventionnisme des forces armées à travers le monde à coup d'arguments démagogiques et manichéens. If you like military-style action films, I'm pretty sure that you'll enjoy Act of Valor, although I'd urge anyone that goes to see this to keep in mind that it's propaganda. I'll say this much about Act of Valor: It's the closest you can come to experiencing a military mission from the perspective of a Navy SEAL without actually enlisting.I'll say this much about Act of Valor: It's the closest you can come to experiencing a military mission from the perspective of a Navy SEAL without actually enlisting. Nothing wrong with a tribute to real-life Navy SEALs, the heroes who took down Osama bin Laden. But Act of Valor is an awkward something else. Que ce film puisse connaître une vie sur grand écran plutôt que de passer directement au DVD ne s'explique que par la fascination qu'exercent les forces armées sur certains Américains. Docu and drama join forces for an ambitious Navy SEAL mission that falls short of accomplished. Regarder Acte de bravoure, c'est en quelque sorte l'équivalent d'une immersion dans le jeu vidéo Call of Duty. Le cinéma n'est pas si inoffensif que ça. 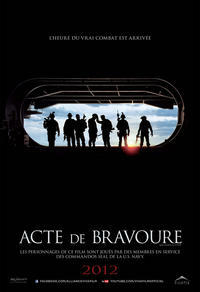 Act of Valor a beau être un long métrage techniquement au point, c'est également et surtout un produit dommageable, qui encourage les gens à aller se battre au front. These special-ops warriors impressively perform their own stunts. But when the movie attempts to humanize them, the dialogue feels forced. Act of Valor, unlike the men who populate it, has an identity problem. Part fiction and part documentary, the film grafts real-life members of the Navy SEALs - and real, live ammunition - onto a concocted narrative and hopes for the best. It soon becomes apparent, however, that whatever talents these warriors possess, acting is not among them.